Battery power is not infinite. It is important to ensure that your users don?t find themselves without any battery power right when they need it the most. 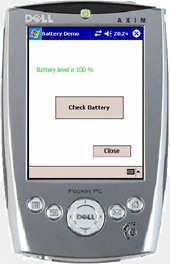 The Sapphire Battery Function Library allows you to read the current battery level and inform the user whether the device will require recharging. This will ensure the user can plan ahead and keep the device charged up. Royalty Free Licence. When you purchase a developer?s licence, you are free to use the DLL in any number of your projects and deploy it to all the devices to your clients. There?s no need for royalties based on the scale of your project, just a one off fee. You will also get 12 months email support and discounted upgrades for future developments.